Choosing a program for patients with mental health and addiction issues is challenging. There are so many options and it is hard to tell what distinguishes one network from another. But medical organizations and experts agree – using measurement-based care (MBC) in treating patients promotes better outcomes. Scientific research has shown the same. In compliance with MBC practices, patients treated at Sovereign Health independently complete standardized questionnaires that are scored and used by treatment teams to guide care. The data is sent to an independent psychiatric performance evaluation service for quarterly analysis and comparison with 50 other leading treatment centers. According to the quarterly analyses from January 2016 to present, Sovereign has consistently ranked above the national comparison group for their overall scores. Sovereign Health has surpassed the national average performance of other comparable organizations. 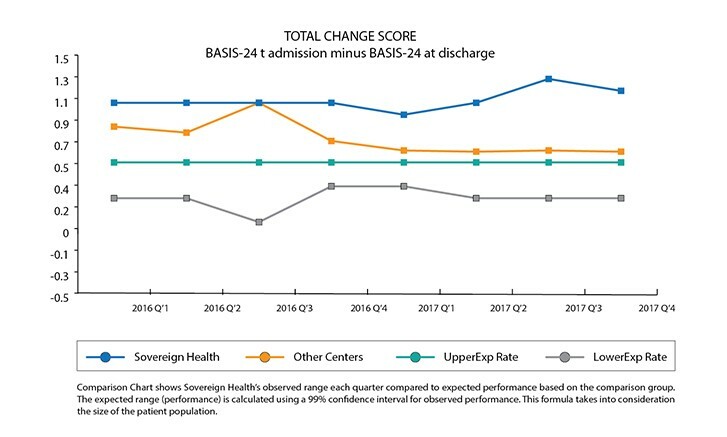 The quarterly reports also indicate that Sovereign’s Health’s residential patients experience, on average, a higher level of improvement in their symptoms and functional deficits from admission to discharge compared to nearly 30,000 patients from 50 other behavioral health organizations across the country. 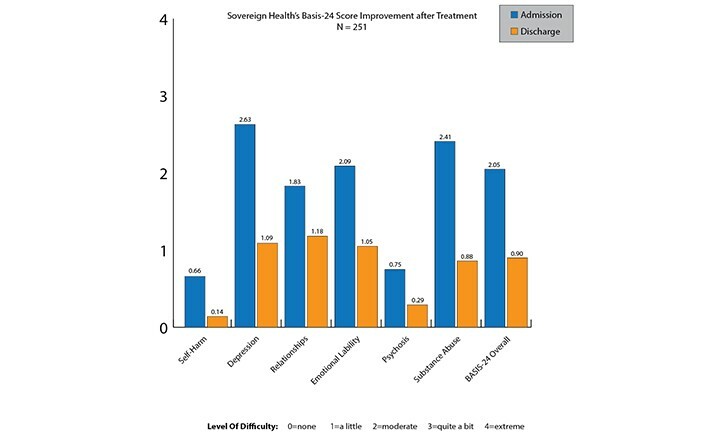 For example, this graph illustrates the remarkable results residential patients at Sovereign Health typically experience (from 2017 fourth quarter BASIS-24® results). The black bars illustrate patients’ symptom severity before treatment at Sovereign Health compared to after treatment (shown in grey). A treatment center’s track record is important when choosing the best option for you or a loved one (for more information about what to look for in picking a rehab and other considerations, click here). The independent data above prove that Sovereign Health is a leader in behavioral health care thanks to our experienced and compassionate doctors and therapists. Learn more about our specialized programs and services by calling our 24/7 helpline at (866) 698-4295.